Not everything on the list is adrenaline fueled (obviously). But a great case in point is #11 “Go into a coal mine.” I may have mentioned this before but a good portion of the list exists because I occasionally get that feeling that I was born in either the wrong time or the wrong place to experience everything I would like to experience. So rather than get my heart rate up, the coal mine is really more of a steep slide into Nerdville. A learning experience and not much more. And that’s exactly what I got at the Lackawana County Coal Mine yesterday. Most important lesson learned: I now know exactly why so many people told me there was no way they were going to let me into a working coal mine. Turns out there are a billion and one easy ways to get yourself killed in a working mine. Good to know. 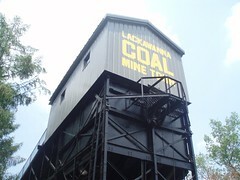 Besides the obvious black lung (which I avoided mentioning on tape mostly out of the shame created by a “too easy” joke) there where a hundred ways to get squished, crushed, or otherwise trampled before you even make it to the coal vein in the morning. Dynamite can blow off important bits. Exposed wiring can electrocute you with impunity. Methane gas buildups can explode or choke the oxygen out of the room. Limbs can be lost to all manner of simple machinery. 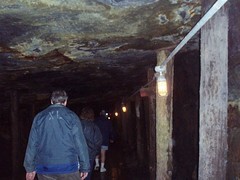 In short, over 100,000 people have died in mine related accidents in America alone. 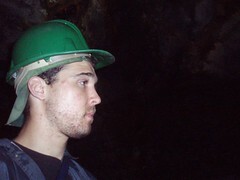 BUT, I got to wander around with a cool “Amtrekker green” hard hat on and learn about all the potential hazards from a tour guide in a mine that has been closed since 1966. Too easy. The temperature underground was about the only saving grace to the job. These guys do not have an easy life. I wish I had time to write more but I’m actually writing this from on set of “The Surrogates” crossing another one off the list! Plus I still have to get that race car podcast out. All this time on the bus is KILLING my productivity. Okay, less talk, more action! I recognize that “I’ve been on a bus for way too long” face. Did I ever tell you I love your writing style. It makes me feel like I’m right there with you. Oh and by the way you can always count on POPCORN! Now you need your own imdb.com page since you are officially part of a movie. Snow white was kissed by a handsome prince one afternoon and awoke abruptly… Mistake. It turns out she isn’t so pleasant after being woken up. The prince and his white horse galloped away in the darkest, quietest part of the night and never looked back. Snow White was so upset that she began to eat, and eat, and eat, until she became so fat that she could no longer leave the house. She demanded the woodland creatures to continue doing the household chores, but they too never returned. She wasn’t the same. Her inner rage grew, and with it, so did she. Her gluttony forced the dwarfs to put in 18 hr days in the coal mine, secretly saving the diamonds they found in hopes that one day, they could bribe a desperate prince into marrying her. But that day never came. The dwarfs grew older and weaker, and as SW ate away their hopes and dreams, the humble cottage in the woods was overturned by darkness. Sleepy went to bed and never woke up. Grumpy’s high blood pressure rose and he went into cardiac arrest. Happy overdosed on anti-depressants. Doc convinced, Dopey, Bashful, and Sneezy into trying to kill Snow White in her sleep, but were arrested for attempted murder. Without anyone working the mines, the cottage went into foreclosure. Snow white was homeless now and had no one to take care of her. Ironically enough, she starved to death in an alleyway behind sizzler. Lesson: Don’t work in a Coal Mine and feed pretty girls.